For the best in Bonaire lodging, rent this villa in Sabadeco. The fully-furnished Crown Ridge Oceanfront Villa 13 includes three bedrooms and two bathrooms and is designed for comfort for up to six people. The spacious interior is rivaled only by the large terrace complete with a private pool and gorgeous ocean views that are made more striking when the sun sets. This island villa is a great choice for avid divers and snorkelers with private beach access on the property and an outdoor shower. Make use of the fully-equipped kitchen or outdoor grill for meals and enjoy premier views when dining outside. 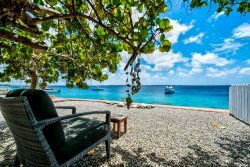 This non-smoking vacation rental includes everything you need for an exceptional Bonaire escape.